South Africa coach Peter de Villiers has named a new-look side to tackle New Zealand in Johannesburg on Saturday. The Springboks boss has made seven changes to the side that lost 30-13 to Australia last month in a bid breathe life into what has so far been a fruitless Tri-Nations campaign. Lock Flip van der Merwe has been handed his first Test start in the place of Danie Rossouw who is struggling with a hip injury and deemed only fit enough for a place on the bench. Elsewhere, Francois Hougaard is set for just his third cap after being named at scrum-half in the absence of the injured Ruan Pienaar. Gio Aplon is switched from wing to fullback with Zane Kirchner another to succumb to injury and that move sees JP Pietersen back on the wing. A new midfield combination of Jean de Villiers and Juan de Jongh gets the nod ahead of Wynand Olivier and Jaque Fourie respectively while prop BJ Botha and flanker Ryan Kankowski are ousted by Jannie du Plessis and Juan Smith. The historic first-ever clash at the FNB Stadium - or Soccer City, which hosted the 2010 football World Cup final - will also mark the 100th appearance of captain John Smit. Speaking about the selection of Hougaard, a player that has played most of the season on the wing for the Bulls, De Villiers said: "He is a player you can take to war. He has a strong head and a good rugby brain and we're looking for someone to bring something extra to the team. I'm excited to see him trying to cement his place in the starting team." 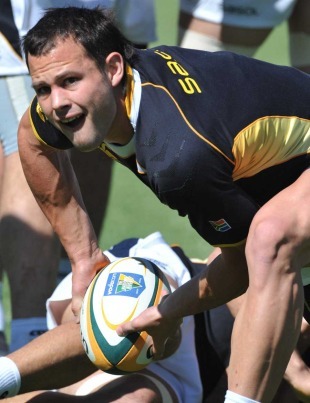 Vice-captain Victor Matfield also praised his club team-mate Hougaard, saying: "He was great on the wing for us, even though he's a specialist scrum-half. He looked sharp starting at number nine for the Bulls in the last two weeks." Matfield also praised his skipper, but highlighted the importance of winning the Test. "I think it's a great achievement for John, who is a guy everyone in SA looks up to," he added. "John would like to focus on the game and win it, then we can enjoy it afterwards which will make the occasion even more special for him. We're looking forward to the match. It will be a massive occasion before the biggest crowd we have played in front of. But to win it is the main objective." Replacements: Chiliboy Ralepelle, CJ vd Linde, Danie Rossouw, Francois Louw, Ricky Januarie, Butch James, Wynand Olivier.